Congratulations to Maggie Walker’s Perisa Ashar (’21-Henrico) who was a Grand Prize winner at the Metro Richmond STEM Fair last weekend. 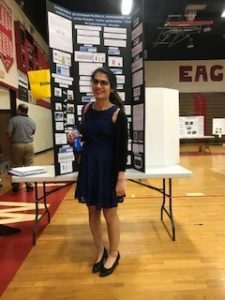 This event is Central Virginia’s regional qualifying event into the Intel International Science and Engineering Fair (ISEF). Perisa won 1st place in Senior Biochemistry for her project entitled ‘In-Vitro Patch-Clamp Study of the ih Current in Nice Thalamus Neurons Including Finding Novel Electrophysiological Biomarkers for Autism Spectrum Disorders.’ Perisa will be presenting her research next at the Virginia State Science and Engineering Fair on April 6th, and then at ISEF in Phoenix, Arizona mid-May.